"I'm looking for a top free online video downloader which can download any online videos from YouTube. Obviously, a downloader supporting more video-sharing sites is more favorable. Any suggestion?" Since many video-sharing sites like YouTube and Dailymotion don't come with a direct download option, most people have strong desire for a powerful video downloader to download online videos for playing offline anytime anywhere or editing the videos for special purposes. Therefore, we will list the top 4 online video downloaders for your reference in this post. One of the top online video downloaders is WinX YouTube Downloader, available to free download SD/HD/4K UHD/8K and 2D/3D videos/movies/TV shows/songs from YouTube, Dailymotion and 300+ other video sites. 100% free and clean. 1. 100% free, clean and easy-to-use online video downloader software. 3. Download online videos from 300+ video-sharing sites, say, YouTube, Facebook, Twitter, Dailymotion, Yahoo, Vevo, MTV, Vimeo, niconico, Break, CBS, Google Plus, Metacafe, Break, etc. 4. Support downloading online free videos in MP4, FLV, 3GP and WebM. 5. Besides downloading SD videos, this top online video downloader is also an expert in downloading HD online videos in 720p, 1080p, 2160p 4K UHD and even YouTube 8K videos while keeping original quality. 6. Free download 3D videos without any glitches. 7. Armed with advanced technologies like Multicast Technology, Multi-thread Technology and High Quality Engine, this video downloader consumes little system source and outputs online videos fast with perfect quality. 1. Incompatible with Mac OS. 2. Unable to convert videos to other formats. To convert downloaded online videos to other video/audio formats, users are suggested to upgrade to an all-in-one video downloader and converter named WinX HD Video Converter Deluxe. 1. 100% free and safe online video downloader. 2. Support multiple Windows operating systems (Windows 8/7/Vista/XP/2003). 3. Download SD/HD YouTube videos to PC. 4. Able to free download 4K UHD videos. 5. Allow users to download multiple videos in a YouTube chanel. 6. It also has a Mac version for online video downloading on Mac OS. 1. It doesn't feature video conversion. 2. It supports online videos downloading from YouTube only. 3. It is unclear whether it can download 3D videos or not. 1. Completely free and clean. This top online video downloader has no malware, adware, virus, etc. 2. Compatible with Windows and Mac operating systems, even including Windows 10, macOS 10.13 High Sierra. 3. Capable of free downloading SD/HD/4K UHD and 2D/3D online videos from over 300 video websites. 4. Convert videos to audios in MP3/AAC and convert videos to MP4. 5. Works as an all-in-one online video downloader, player and manager. 6. Available to free stream downloaded movies videos songs for iPhone, iPad and Apple TV with the built-in AirPlay feature. 1. 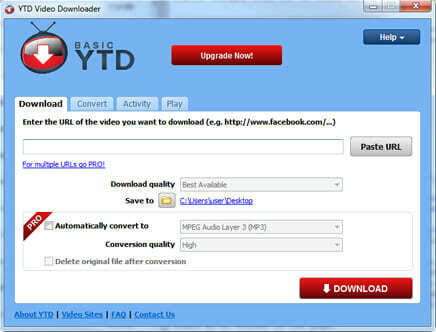 YTD Video Downloader basic version enables users to free download videos. 2. Support downloading online videos from 60+ sites like Facebook and Vimeo. 3. Available to change the video format of downloaded online videos to WMV, AVI, MP3 and more. 1. It is unable to download multiple online videos simultaneously. 2. It includes a Malware hack using Spigot Search Protection to force Adware onto not only your PC but also your Mac. BEWARE!!! Here, we will take one of the top online video downloaders namely WinX YouTube Downloader to see how to free download online videos. After downloading and installing it, you can follow the steps below to begin downloading your favorite videos. 1. Launch the online video downloader and click the chain-like button. Then open YouTube or other site, find the video you want to download, open it and copy & paste the URL to the URL text box of the best online video downloader. 2. Click "Analyze", and give it a few seconds to fetch the video information. Once finished, please specify which file format/resolution is your choice and click "Ok" to go on. 3. Set destination folder to store the downloaded online videos and hit "Download" button to move to the download process. WinX HD Video Converter Deluxe - Free download online videos from 300+ video-sharing sites, and convert the videos to AVI, MOV, MP4, WMV for PC/Mac and Mobiles.